This homemade vegan seitan chicken recipe is easy to make, just 8 ingredients, can be made ahead of time, and once prepared can be used any way that you might have cooked chicken- marinate, bread, fry, crust, bake, grill, BBQ, the options are endless!!! Add all of the ingredients to a food processor and pulse to combine until everything is well mixed and the dough forms a ball. Alternatively, if you do not have a food processor you can mix everything together in a large bowl working the dough until it forms a ball. Lightly dust a clean work surfaces with a bit of the vital wheat gluten. Turn the dough ball onto the surface and lightly dust the top with a little more vital wheat gluten. The dough will be soft and very sticky so this will help it from sticking to your hands. Do not knead the dough, kneading it will make it tough. Cut the dough ball into 6 pieces and use the tips of your fingers to press each piece of dough into an oval shape about 5" x 6". Add several inches of water to a large pot with a steamer basket and bring to a simmer. Lightly grease the steamer basket and lay the tenders in the basket. If the tenders need to overlap each other, spray the tenders with a bit of oil to stop them from sticking together. Cover and steam at a simmer for 25 minutes, flipping halfway through so they steam evenly. They will double in size. Make sure to keep it at a gentle simmer for the best texture. Once steamed, remove the tenders and let cool. Cover or put in an airtight container and chill in the fridge for a minimum of 1 hour, or for up to 3 - 4 days. You can either chill the tenders without any additional seasoning, or you could toss the tenders in your favourite marinade. The tenders shrink and firm up a bit when chilled and this results in the best texture. Once chilled, the tenders are fully cooked and edible, but you can now treat them as you would raw chicken -season and cook them as you desire. The cooking time can be short as they only need to be heated through but prepare them any way that you might prepare a chicken breast. Pan fry or grill them, bread or crust them, slice them for salad, pasta, or stirfry, cut them into nuggets, add them to burritos, tacos, or sandwiches. The options are endless! *If the end appearance of the tenders is important to you, make sure to allow lots of room around each tender to expand. You may want to steam the tenders in batches as when they overlap each other they can sometimes end up as weird shapes. 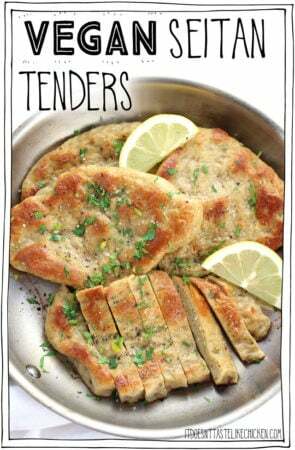 This won't matter if you plan on slicing them, but you can consider it if you plan to serve the tenders whole. *To freeze the tenders, let them cool completely before freezing. Freeze in an airtight freezer bag or container. You can freeze them plain or in the marinade of your choice.